Our early evening events are aimed to be fun and interesting to everyone, including families with younger children and for these events we offer reduced family tickets for two adults and two children. We run the shorter Family Astronomy every Saturday afternoon, “Space Kids” in school holidays and our brand new programme of events called “Introduction to Astronomy” will now be running most days from 5pm until 7pm. They cover concepts such as navigating the sky or telescope workshops. Recommended ages are six years old and upwards. The focus of these events is on education and introducing the basics of astronomy, but if the skies are clear we may get the chance to glimpse the moon, a planet or maybe the sun depending on the season. 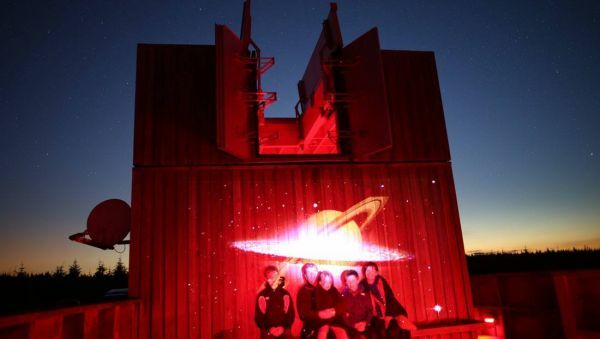 You will still get to see our fantastic telescopes up close and the team will be on hand to answer everyone’s questions. Sat-nav users beware, the observatory does not have a postcode. Coming northbound from Bellingham the turn off for the observatory is about 1/2 mile before Kielder Village (NE48 1ER), the track is clearly marked with a brown road tourism sign labelled "Kielder Skyspace and Observatory". Southbound from Scotland drive straight past Kielder Village (NE48 1ER) then the turn off for the observatory is about 1/2 mile after the village, the track is clearly marked with a brown road tourism sign labelled "Kielder Skyspace and Observatory". The track will be opened to vehicles 1 hr before the event starts and it is a further 2 miles through the forest to the observatory visitor car park. If the track is not open when you arrive please wait for a staff member to arrive, the track is suitable for most vehicles but do not exceed 15mph. Disabled visitors may park beside the observatory building. We have no waiting area so if you arrive very early please wait in the decking area or in your vehicle.